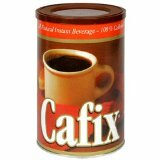 Cafix is a brand name of a product that is a coffee substitute which is made from various items such as beets, chicory, figs, barley, etc. It comes in several sizes, and all of them are instant beverages. You can choose from a regular type of instant to crystals. Several price points to choose from. Some people prefer it as it is naturally caffeine free and considered by some to be a safer and milder type of hot drink.